Kavya was busted when her mother found the truth about her, sneaking out from the house in the midnight. ‘Dad doesn’t know? Thank God!’ Kavya sighed in relief! ‘Not yet, and this is the last warning, mind you! Tell Ishan to talk to his parents, you are 22 now, and he is 28, we are thinking of getting you engaged, you are in final year of your graduation already. Just complete the graduation and start with your married life…we were waiting for this day since your childhood!’ Kavya’s mother kissed her forehead. ‘Really?’ Kavya always wanted to get married to Ishan to end this long distance relationship, but never did she thought of her parents also to have a similar approach! She was overwhelmed and called up Ishan immediately. He agreed to bring his parents to Chandigarh the next week, so that everything could be finalized for their engagement! Ishan’s parents reached Chandigarh along with few relatives, and as expected, things went smooth and their alliance was approved by both the families, and so their engagement was finalized. It was scheduled after three weeks, and a lot had to be done. 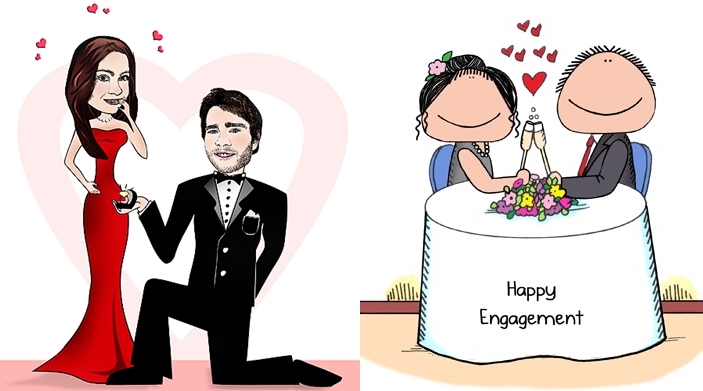 Engagement was supposed to be held in Bangalore, and not Chandigarh, while the wedding was scheduled in Chandigarh. The big day, finally arrived! ‘Relax, Kavya! Calm Down! You look fantastic and Ishan will probably die if he’ll watch you today’ Disha winked and pinned Kavya’s dupatta in her blouse and she was all set to enter the hall now. Everyone in the hall was mesmerized by looking at Kavya, who looked like an angel that night. With a light green lehenga and silver accessories, she was looking like a goddess. Ishan watched her dumbfounded and his parents were proud of his choice. Kavya was walking flawlessly towards the stage, and everyone kept staring at her till Ishan held her hand and helped her step up the stage. They exchanged the rings and were now engaged. The feeling was so beautiful and pure, Ishan hugged Kavya and they all left for Chandigarh after the ring ceremony. The marriage was still a month ago, and Kavya and Ishan were experiencing the toughest phase of their relationship now. ‘Hahaha, I understand the feeling, Mr. Rao’ Kavya was teasing Ishan, while Ishan was getting restless and was missing her. Ishan was annoyed and pissed off. He just wanted the month to pass as soon as possible, so he could be with his sweetheart, once and for all. While Kavya wanted a little more time to spend with her parents. She still couldn’t believe that soon she would leave her mom and dad to stay with Ishan in Bangalore. Bangalore suddenly sounded like a different world altogether! She never wanted to leave them, but then she wanted to stay with Ishan too. Her mind was in the ugliest dilemma, and she just closed her eyes, lied down on her bed, and went to sleep! Like all your stories simply sweet and charming! But critically, maybe you should stressed on what made them fall for each other and make them an inseperable cute pair. Its was kinda fast and felt more like timeline. The storyline is awesome, your language and style simply perfect, maybe you could have added something more….making it more realistic! The parents agreeing to marriage was a little tooo fast! But wonderful simple and cute.! 🙂 Thanks a lot dear!